On Friday 3rd September, along with Susan and Martin, I attended a talk given by Dr Peter Burt of the Nuclear Information Service at St John and St Stephen’s Church in Reading. There I learned about massive investment that was underway to develop the Atomic Weapons Establishment (AWE) at Aldermaston. As someone who has been involved in peace campaigning for a long time I knew of course that AWE Aldermaston is the main centre for developing and building nuclear warheads in the UK. I knew that the Trident nuclear programme depends on AWE to design, test, build and maintain Britian’s nuclear warheads. I knew that around 200 nuclear warheads were built at the site in the 1990s and that those nuclear weapons continue to be brought back to be tested and maintained. From Dr Peter Burt however, I learned about the massive upgrade that is being undertaken at the site now and what is expected to happen at AWE over the next few years. I learned about ‘Project Mensa’ the new warhead assembly building. I learned about ‘Pegasus’ the new enriched uranium facility; and I learned about Project Hydrus, the proposed hydrodynamics research facility . 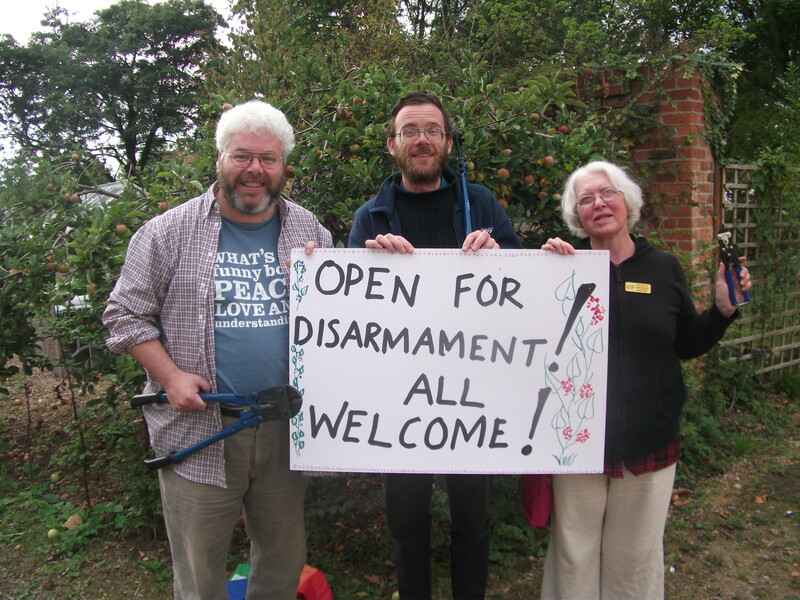 On Monday 6th September along with Susan and Martin – and as part of a Trident Ploughshares week of action – I went to AWE to open the base up for ordinary people to begin the process of disarmament. It seems very clear to me that ordinary people need themselves to begin the process of nuclear disarmament. We can no longer leave it in the hands of politicians or the military whose so-called attempts at disarmament are, at best, shameful, at worst a sham. As a Christian I believe all are called to be peacemakers. There are many visions of peace in the scriptures but one that resonates with many today in our heavily militarised world is Isaiah’s vision of swords being beaten into ploughshares. And the passage is clear about who is to undertake the task. God does not beat swords into ploughshares. Nor do kings, military commanders of politicians. It is ordinary people who are given this great mission. On 6th September Susan, Martin and I cut the fence at Aldermaston to create a gateway and called on people to join in the great task of nonviolent peacemaking. Thirty years previously, eight people had entered the King of Prussia nuclear weapon plant in Pennsylvania and undertook the first piece of direct nuclear disarmament and our action on 6th September were inspired by, and rejoiced in, that act of direct disarmament. 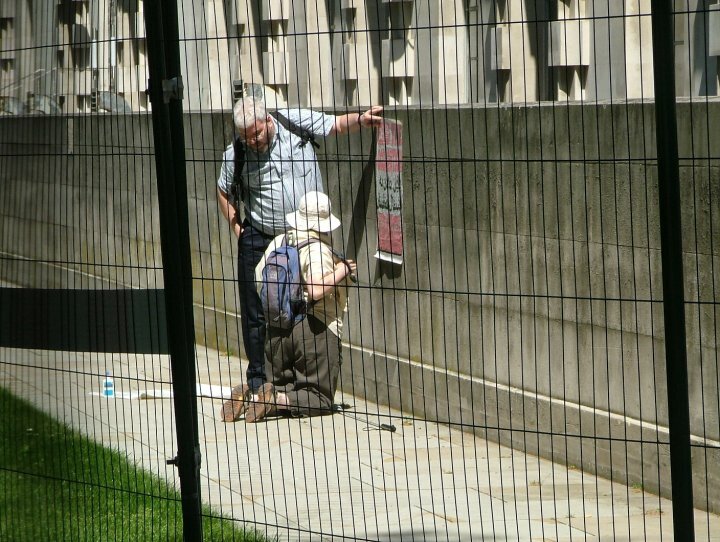 Having cut through the fence we attached a sign above saying ‘Open for Disarmament: All Welcome’ and we went through the breach we had created. (A positive breach for disarmament in symbolic contrast to breach of the NPT.) We hung a peace flag on the inner fence, held hands, prayed and sang. Within a couple of minutes police arrived and we were quickly arrested. And so here we are in court today. We are charged that we damaged the fence, contrary to the Criminal Damage Act and trespassed or a ‘protected nuclear’ site, contrary to SOCPA Act. I have stated that I cut the fence but I believe that it was the right thing to do – that I have lawful excuse in that I was attempting to prevent what I belive to be a crime under international law, and God’s law. As the court will be well aware S.3 of Criminal Law Act 1967 states that a person may use such force as is reasonable in the circumstances in the prevention of a crime. Ordinary citizens have a right – a duty indeed – to both uphold the law and to work for the common good. What constitutes a crime is the focus of what I want to say here today. In other words, the courts can turn a blind eye to the massive conspiracy to threaten millions of people with extinction through nuclear war, simply by saying: sorry, actually that’s not a crime as we understand crime to be. Development, deployment and no doubt use of nuclear weapons, which cannot be anything but a war crime under international law – as nuclear weapons are incapable of distinguishing between civilians and combatants – will not be criminal according to the British courts. But that is I’m afraid nonsense. It is of course morally, ethically and legally wrong to plan for and prepare for the indiscriminate murder of millions of people by developing, testing, building and deploying nuclear weapons. That is a crime as any sane and reasonable person would judge. In the Christian church, a crime against God and the common good is called a sin. The Jesuit priest, Fr Richard McSorley stunned the Church at the height of the cold war by stating simply that it is a sin to build a nuclear weapon. “The taproot of violence in our society today,” he wrote, “is our intent to use nuclear weapons. Once we have agreed to that, all other evil is minor in comparison. Ignoring the crime of nuclear war preparations, giving legal sanction to what is perhaps the ultimate violence in our world today, undermines any condemnation of violence in our society. And the consequences of that sin are there for all to see, not least in the result of the theft from the poor of the huge amounts of resources that it takes to build these damn things. The three of us went to AWE Aldermaston to say as clearly as we could that the emperor has no clothes. Nuclear weapons – mass violence – will not save us, bring us peace or security. Rather our hope and our salvation lies in love of neighbour and working for the common good by following the way of nonviolence, the way of Christ. Pretending something that is bad is good, will lead inexorably to trouble, said the prophet Isaiah some 3000 years ago. Pretending that a crime is in fact lawful will similarly lead to trouble. particularly such a heinous crime as the preparation of the mass murder of millions of people. compounding that crime is the criminalization of those who attempt to expose the lie. I urge the court to recognise the emperor has no clothes. I urge the court to recognise the simple fact that planning and preparing for nuclear war is a crime. I urge the court to uphold the fact that peacemakers have a duty to prevent such a crime and I urge the court to find us not guilty. So with spray can in hand I went to the conference centre just before the event and sprayed ‘build peace not war machines’ ‘stop this bloody business’ and ‘arms trade=death’ on the front entrance and poured fake blood over the steps. (See CCTV footage here). I was shortly convicted of criminal damage and fined just under £2,000. Eighteen months (and numerous court letters, bailiffs threats and visits) later it’s time to go back to court to explain my actions and why I won’t pay the fine. 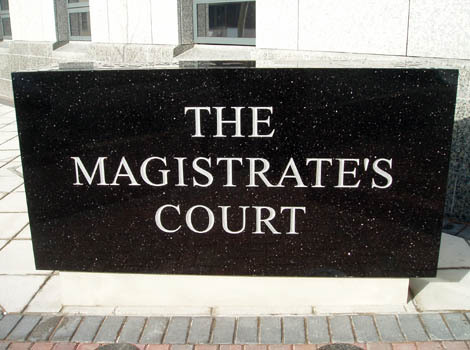 I spent most of yesterday, the feast of the Epiphany, in Newbury Magistrates Court waiting to plead ‘not guilty’ to charges of criminal damage and criminal trespass following a peace witness at the Aldermaston Atomic Weapons Establishment in September. It was a strange day – not least because the MoD police had forgotten to bring the paperwork, statements etc. and so we had to wait around the court for hours for the papers to arrive. But the day for me was also about remembering my ploughshares action on the Feast of the Epiphany exactly eighteen years ago. In my statement left at the scene of disarmed BAE weapons systems, I said “The Epiphany remembers when three men presented gifts to the infant Jesus. My gift of disarmament is for all the infants who are threatened with BAe weapons, from Northern Ireland to East Timor.” Eighteen years later and, thank God, the children of Northern Ireland and East Timor do sleep more safely in their beds but of course other children are desperately threatened, not least by the nuclear warheads built and tested at AWE Aldermaston and the lethal weapons that BAE Systems continues to develop and ply around the world. But, as Fellowship of Reconciliation member Margaret Mead said “Never doubt that a small group of thoughtful, committed citizens can change the world. Indeed, it is the only thing that ever has.” That’s not to say it’s easy – far from it – and it’s hard to see how any specific ‘action’ or piece of work (or blog post!) does make a specific difference. Nevertheless actions, and work and people resisting injustice together make up a movement and movements do make a difference. It may be mostly about faith and hope, but also, as one of the one of the great unsung heroes of the 20th Century nonviolence movement, James Lawson, would say, it’s also a question of persistence….. So here’s to another eighteen years of faith, hope and persistence. Peace in our time? Let’s be incredible! 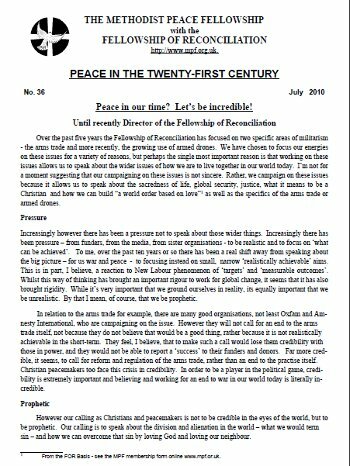 A few weeks agao I was asked to write a short article on the need to be prophetic for the ‘Peace in 21st Century’ newsletter. Here’s the result! Over the past five years the Fellowship of Reconciliation has focused on two specific areas of militarism- the arms trade and more recently, the growing use of armed drones. We have chosen to focus our energies on these issues for a variety of reasons, but perhaps the single most important reason is that working on these issues allows us to speak about the wider issues of how we are to live together in our world today. I’m not for a moment suggesting that our campaigning on these issues is not sincere. Rather, we campaign on these issues because it allows us to speak about the sacredness of life, global security, justice, what it means to be aChristian and how we can build “a world order based on love”1 as well as the specifics of the arms trade or armed drones. Increasingly however there has been a pressure not to speak about those wider things. Increasingly there hasbeen pressure – from funders, from the media, from sister organisations – to be realistic and to focus on ‘what can be achieved’. To me, over the past ten years or so there has been a real shift away from speaking about the big picture – for us war and peace – to focusing instead on small, narrow realistically achievable’ aims. This is in part, I believe, a reaction to New Labour phenomenon of ‘targets’ and ‘measurable outcomes’.Whilst this way of thinking has brought an important rigour to work for global change, it seems that it has also brought rigidity. While it’s very important that we ground ourselves in reality, its equally important that we be unrealistic. By that I mean, of course, that we be prophetic. In relation to the arms trade for example, there are many good organisations, not least Oxfam and Amnesty International, who are campaigning on the issue. However they will not call for an end to the arms trade itself, not because they do not believe that would be a good thing, rather because it is not realistically achievable in the short-term. They feel, I believe, that to make such a call would lose them credibility with those in power, and they would not be able to report a ‘success’ to their funders and donors. Far more credible, it seems, to call for reform and regulation of the arms trade, rather than an end to the practise itself. Christian peacemakers too face this crisis in credibility. In order to be a player in the political game, credibilityis extremely important and believing and working for an end to war in our world today is literally incredible. However our calling as Christians and peacemakers is not to be credible in the eyes of the world, but tobe prophetic. Our calling is to speak about the division and alienation in the world – what we would term sin – and how we can overcome that sin by loving God and loving our neighbour. There is of course much more to say about this state of affairs but in the short space that I have I would want to make two brief comments. Firstly, as Christians we are working to a different understanding of time and time-scales than the world. We know that the principalities and powers have been defeated by the Prince of Peace but it has yet to work itself out in history. Also in relation to time, we, as a community of peacemakers, are part of a movement that stretches itself way back in time and way forward into the future. Our work for peace and justice must have an understanding of that view of time. I am saddened by people who expect – and are then subsequently disappointed – when ‘peace’ is not achieved after a particular campaign, or event or witness. Our work for peace is the work of our lifetime. Indeed we could say that the work for peace is thework of time itself. We long for the ending of time and the coming of the eschaton2 and our daily work for peace must be seen in that light and not in an effort to gain worldly credibility. Secondly, as Christians, we know who it is who will bring peace. It is not us and our work alone thatwill be effective in ending war, violence and conflict. Our human tactics, lobbying and strategising, our organisations and campaigns are created by imperfect fallible, sinful human beings. Our work for peace and reconciliation must be inspired by the Holy Spirit through being rooted in prayer. However we must be careful here. It is not faithful in any way, I believe, to be completely disinterested in the effects of our work. We must simply not make effectiveness into an idol. As Daniel Berrigan said “The good is to be done becauseit is good, not because it goes anywhere.” As Christian peacemakers we may sometimes (often!) be out of step with how the world sees peace and seeks peace. I believe that our calling is to be prophetic and to witness to the peace of Christ rather than to be realistic and seek peace in the world’s terms. 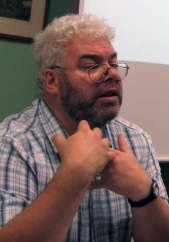 Chris Cole has recently stepped down as the Director of the Fellowship of Reconciliation. He will continue to campaign, write and act for peace. For more details see http://www.figtree.org.uk. Yesterday, my old Catholic Worker friend Ciaron O’Reilly and I undertook a protest vigil at BAE Warton. Both of us had been to BAE Warton many times in the past and indeed, both of us have a life-time injunction to keep off all British Aerospace (the former name of BAE Systems) property. 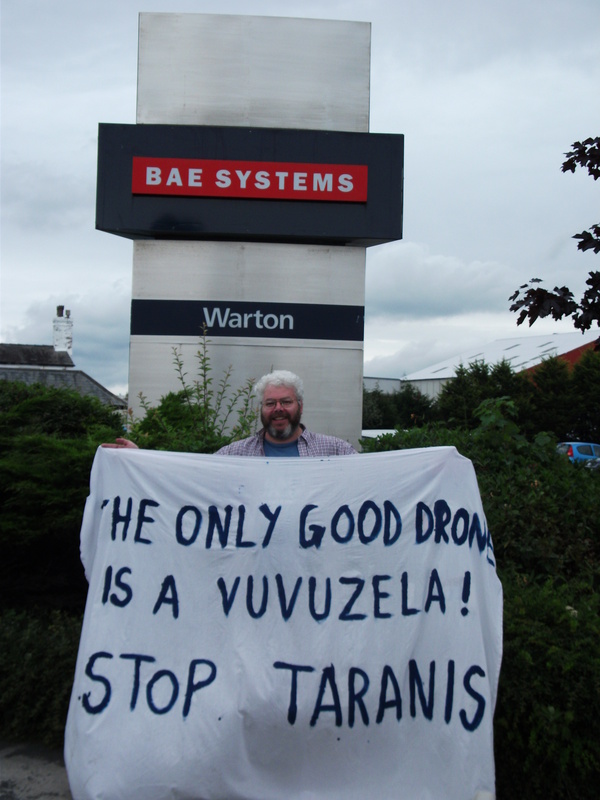 Nevertheless we made an eight-hour round trip by car up to Preston as BAE systems were calling people to gaze upon their new unmanned combat drone, Taranis, as it was being launched. Taranis, named after the Celtic god of thunder, is the newest unmanned aerial vehicle (UAV) or drone which is just the latest in a long line of weapons used in erroneous belief that they will provide a clean and tidy solution to a conflict – time and again history has proved that this is a myth. 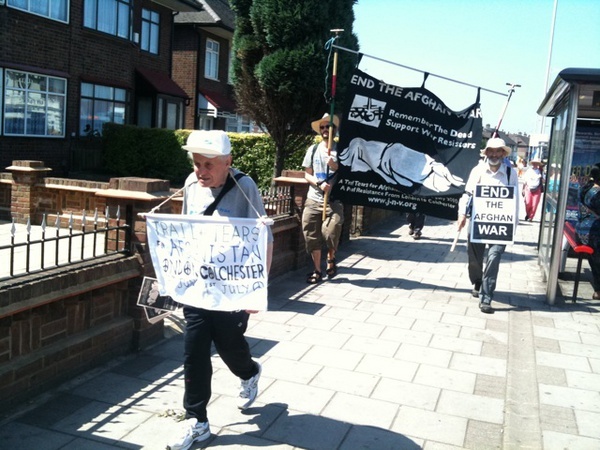 Along the thirteen mile stage from Ilford to Brentwood via Romford, we had a lot more support than I really expected. Of course there was the occasion hurled bit of abuse, but it was far outweighed by the supportive comments and thumbs-up from many people we passed. The war in Afghanistan is deeply unpopular with a large cross section of our society. The walk was an opportunity to catch up with some old friends but also a chance to make new ones. At one point I fell into conversation with a young Scottish women who I discovered had just returned from doing an internship at Wi’am, the Palestinian Nonviolence Centrer, set-up by my old friend Zoughbi Zoughbi in Bethlehem. In the evening I spoke about the growing use of armed drones in Afghanistan and Pakistan at a public meeting organised by the walk’s organisers, JNV and then drove back to Oxford along with Ann, the newly elected Chair of Pax Christi. What I call a good day! Some people will know that I am stepping down as Director of the Fellowship of Reconciliation (FoR) in a few weeks to begin a new adventure – Fig Tree. Fig Tree is the umbrella under which I will undertake work for peace and nonviolence and to challenge the culture of violence and militarism. In many senses this is a continuation of the work that I have been doing for the last seven years at FoR (and, indeed for twenty years or more under different hats). Its hard therefore in some senses to say ‘this is when Fig Tree starts’. But a few weeks back I realised that Pentecost was on the horizon and decided that Fig Tree starts at Pentecost. The newly appointed Defence Secretary Liam Fox has been pretty busy. Not only has he had to get his feet under the table at the office and prepare for the strategic defence review, but he also found time to take part in the very first meeting of the brand new National Security Council and to send a message to all defence staff. Not for him the quiet settling in period. In his message Liam Fox repeated the tired line that British forces are not in Afghanistan “out of choice”, but out of ” necessity”. This tired nonsense does not bode well for the coming defence review under Liam Fox’s leadership. Roland Leighton serving on the Western Front, to his Sweetheart, Vera Brittain. (Roland Leighton was killed in action in December 1915). So all this huff and puff about “defence of our country” is poppycock. By all means try to make the argument that we need to have sufficient armed force to invade other countries to enforce regime change so that the West’s economic and political interests are served, but please do not dress this up as “defence of our country”. I think we are all going to need strong stomachs over the the next few months as there will be a lot of cant spoken about ‘defence’ as the strategic defence review gears up.